Upon first glimpse Lackawanna Valley by George Inness looks like a beautiful landscape, but as your eyes survey the scene you notice that nearly every tree in the foreground is cut down. This alone sets two different tones to the painting. 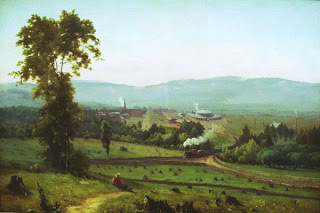 In one way, when i look at this painting; it feels relaxing almost romantic, but on the other hand the signs of industrialization make the mood more solemn almost like a painting made to capture the landscape before its destruction. To me the painting is more of a sad scene then a romantic vision of the pioneered West. Even though the town off in the distance is small and peaceful looking, the tree stumps on what used to be a forest; show the price that gets paid for expansion. A train cuts across the field and centers your view of the landscape. This brought my attention to the person who is lying on the hill in the foreground. This to me symbolized the attitude of those times. Everyone seemed to be blinded by progress, no one saw how the land was being affected. Good analysis- I agree very much with your claim that it's intentionally a romantic view, in the sense that concepts like "progress" "nation" and especially Manifest Destiny were highly romanticized (and mystical) components in the narrative of the nation.